Why is my pig coughing? It is logical to assume that any factor that irritates or inflames the respiratory system will elicit the physiological response of either sneezing or coughing or both. However, not all diseases of the airways produce such expected clinical signs. In pigs, chronic bronchopneumonia is more commonly seen as a failure to thrive rather than as outbreaks of coughing and labored respiration. Coughing is therefore generally an indication that whatever insult is causing it is in its early stages. ALWAYS be sure the cause isn't because your pig is choking. Pigs tend to swallow without chewing and sometimes when foods are cut in certain ways, it is easy for that to get stuck in the throat. It doesn't always lead to choking (and choking has additional symptoms that may accompany a cough) but your pig can still have something caught in the throat that can turn a cough into an emergency situation if the object moves and obstructs the airway. Here is a page for CPR/Heimlich maneuver as well as rescue breathing and ways to dislodge objects that may be stuck in the throat. Click here to be directed to that page. Unless individual pigs are identified as they are first seen to cough, the observational impression is that a certain percentage of a population of affected pigs is always coughing assuming you have more than one pig. This portion will not necessarily be the same pigs at each observation because, as time passes, some pigs recover as others become affected. The pattern of coughing can therefore provide useful information in making a diagnosis. A sudden and widespread outbreak of coughing indicates a either an environmental insult or a highly contagious and infectious pathogen has suddenly presented itself. On the other hand, constant coughing in clusters of pigs might indicate a more longstanding problem. Coughing is an important defensive reflex reaction designed to expel inflammatory secretions and foreign material from the respiratory tract. If the mechanism of coughing is suppressed for any reason, the system is not cleared of infection and the situation becomes chronic. Although alarming and indicative of disease, coughing is at least a sign that normal physiological responses are taking place and should not in isolation be necessarily seen as a bad thing. The infectious pathogenic agents that are normally associated with coughing or labored breathing in pigs. The most commonly occurring and most important are shown in bold type. 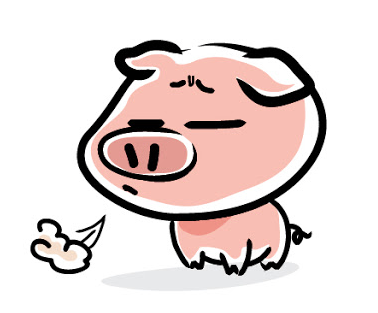 After determining the cause of the cough, pigs can have cough medicine to help. ~Children's cough syrup – (dextromethorphan 15 mg per 10 ml) – 10 ml per pig twice a day. Pathogens that cause coughing and/or dyspnea in pigs. In addition to pathogenic agents, it must be appreciated that there are other factors that will from time to time cause pigs to cough as in the examples below. Other causes of coughing and/or dyspnea in pigs. Infection with the roundworm, Ascaris suum, is often associated with coughing because it causes an eosinophilia inflammation of the lung as the third larval stage of the life-cycle migrates through the lung tissue. The larval migration can also act as a trigger factor for otherwise dormant bacterial infection. Anemic pigs may show labored breathing as they struggle to compensate for lack of oxygen arising from the reduction in circulating red blood cells and therefore hemoglobin. They will be more prone to the inhalation of foreign material, which, in turn can cause coughing. If cardiac insufficiency arises, respiratory secretions are less easily cleared from the lung and a “heart cough” can develop. However, this is more likely to be associated with occasional individual pigs. Environmental causes of coughing are relatively common. I (the author) personally know of a number of farms where coughing occurs in finishing pigs but there is very little visible pathology to be seen on the slaughter line. In these situations, gross irritation of the airways, together with suppression of the microscopic lung defense mechanisms, will lead to coughing. The most common causes of this combined effect are hot conditions and dust. Other airborne contaminants associated with dust, such as bacterial endotoxin and fungal spores, make matters worse. The approach to solving the problem of coughing pigs must therefore always be multifactorial.